This project was a collaboration between myself and Baroness Isobel le Breton (Politarchopolis). 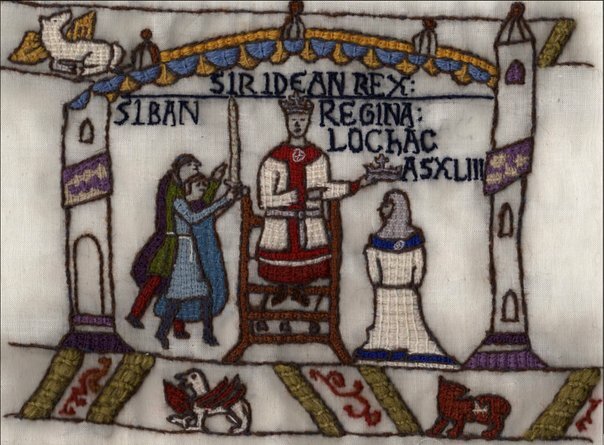 We designed and embroidered a panel of linen as a gift from Politarchopolis to Duke Siridean to commemorate his coronation. In line with the period of Siridean’s persona, we chose the Bayeaux Tapestry as our inspiration for the design and execution. Gift for King Siridean, by Lady Ceara Shionnach and Baroness Isobel le Breton. We also provided documentation with the panel: Gift from the Barony of Politarchopolis to His Majesty King Siridean (pdf). It explains the scope, execution and references used for this embroidery piece. If you haven’t seen it, there is a nifty animation based on the Bayeaux Tapesty that can be viewed online: The Bayeaux Tapestry Animated. The frame that our project is based on can be seen at the 14 second mark and depicts the coronation of King Harold. The stitches used in our panel are stem and laid-and-couched stitches. The latter is also known as ‘Bayeaux Stitch’. If you are interested in learning how to do these stitches for yourself, I wrote instructions for both stitches, available here: Laid and Couched Embroidery (pdf).